Advantages: Interesting subject choices; includes national markings and stencil markings; comprehensive instructions; high quality decals printed by Cartograf. Conclusion: These decals offer three interesting alternatives for the magnificent 1/24 scale Airfix Hawker Typhoon. As always, a high quality offering from Eagle Editions. Highly Recommended. Eagle Editions has been busy with new releases lately. 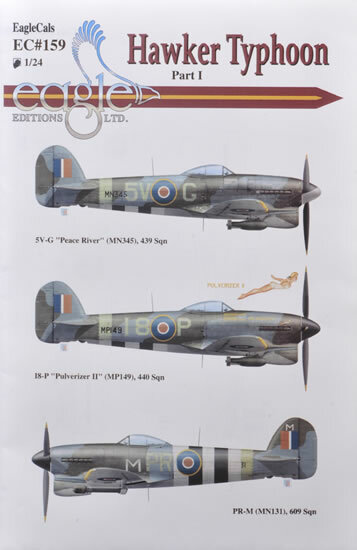 One of the latest batch is a set of three alternative markings for Airfix's big beautiful 1/24 scale Hawker Typhoon. The decals are beautifully printed by Cartograf and in perfect register. 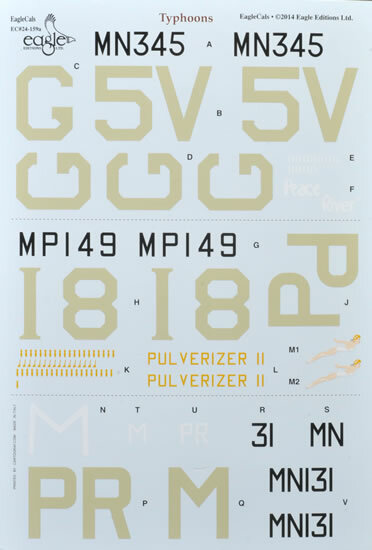 Two sheets are offered here, including all the nececessary unique codes and serial numbers plus a full set of roundels and fin flashes and even selected stencil markings. The instruction artwork features finely reproduced halftones, weathering plus realistic depiction of light and shade. The large versions of these illustrations are very attractive indeed. In common with earlier EagleCals releases, the research behind these decals and the artwork is first class. 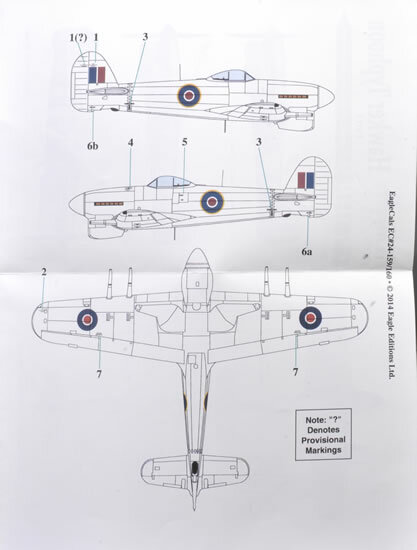 In addition to the colour marking guide, a helpful text description of each aircraft is provided noting the unit, the pilot, the aircraft's fate and details of camouflage and markings. A full-page stencil placement guide is another useful feature. All aircraft are finished in RAF Ocean Grey and Dark Green upper surfaces with Medium Sea Grey below. The first two subjects have remnants of invasion stripes on the lower fuselage only, while PR-M retains full invasion stripes on the fuselage and wings; along with supplementary code letters. 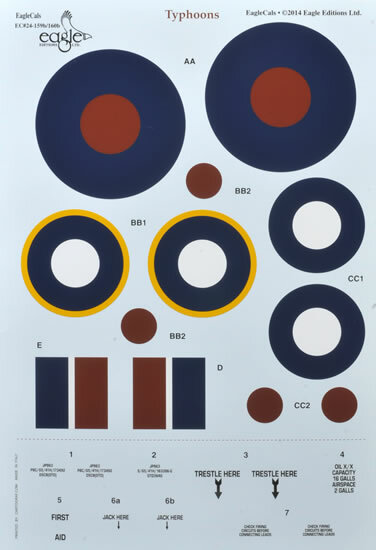 These decals offer three interesting alternatives for the magnificent 1/24 scale Airfix Hawker Typhoon. As always, a high quality offering from Eagle Editions.